These are the slides and notes for the talk I gave at the American Alliance of Museums conference on Monday, April 27 about the Santa Cruz Museum of Art & History. There are links embedded to other posts that go deeper into specific topics. For years, I’ve been associated with the idea of “visitor participation.” When I became the director of the Santa Cruz Museum of Art & History four years ago, I took this work with me. We invited community members in, to be active contributors, collaborators, and co-creators in our museum space. We had incredible success transforming our institution into a vibrant cultural center. But when people told us what they loved about the museum, they didn’t use the word “participation.” They talked about community building. Participation is one (of many) tactics for building community. As time has gone on, my attention has shifted from the tactic of participation to the outcome of building community. And so today I want to talk about building community: the who, the how, and the why of it. "Community” is not an abstraction. It is a group of people connected by something shared. That something may be a place, an identity, an interest, a worldview. The most important first step for any institution that seeks to “engage community” is to be specific about WHO you are talking about. At the Santa Cruz Museum of Art & History, our community starts with geography. We exist for people who live in Santa Cruz County. We are unapologetic about focusing local. Even though Santa Cruz is a tourism destination, we mostly ignore tourists. Tourists can’t help us build community in Santa Cruz County if they are only in town for a day. Focusing local helps us define our community by identity. We have partnered with the county-wide community assessment project to learn more about the demographics, interests, and needs of local residents. In some ways, we do a good job engaging people who reflect our whole County. Our audience’s income diversity matches that of the County. We’re connecting with people across all age segments in our County. Right now, we're working hard to empower Latino residents to see themselves in our museum. We live in a City that is 19% Latino, in a County that is 33% Latino. Our visitors are about 8% Latino. If we want to reflect the identities of our community, we’ve got to focus on changing that. At the same time, “identity” doesn't always mean demographics. For example, in Santa Cruz there is a huge community of creative people who identify as artists in non-traditional media. That’s why we partner with fire sculptors, knitters, graffiti artists, and bonsai growers. They are artists whose experience deserves a home in our institution alongside painters, photographers, and sculptors. Finally, we define our community by affinity. We focus on people who are culturally curious, actively creative… but may not see a traditional arts institution as a place for them. We’re unapologetic about connecting people with history and with art in new ways, even if those ways are sometimes in conflict with more typical museum practice. We think about this redefinition of affinity not just in terms of our programming but our internal structures as well. Some of our best volunteers come from the County court referral system. We're a place you can work off your traffic ticket. And that means we get volunteers who are A. very motivated to complete their hours and B. culturally curious but maybe not inclined to walk into a museum. They see "museum" on the list of options and they think: hey, I like history, I dig art, maybe this is a good option for me. We've hired amazing people out of this unorthodox volunteer pipeline. Doing this work in partnership with our local community, in partnership with people who have an affinity for active cultural experiences, we’ve been able to grow rapidly and tremendously. Over four years, we’ve tripled our annual attendance and more than doubled our budget and staff and programs. Last year, our board and staff came together to develop a “theory of change” that connects the activities we do to the impact we seek. We decided as an institution to focus on just one impact statement: “our community grows stronger and more connected.” It feels amazing to be so aligned and clear about purpose. We’re making our focus on community more overt, tangible, and measurable. There are three “tracks” to our theory of change: individual empowerment, social bonding, and social bridging. Let’s start with empowerment. We seek to empower our visitors to raise their own civic and creative voices. A lot of museum visits can actually be disempowering, making people feel they are not smart enough or cultured enough to get it. We want everyone to leave the museum feeling that they could become an historian or artist—a civic and/or creative agent of change. Empowering people starts by involving and including them. Showing that their voice matters. This starts right when you walk into our museum, where you can share opinions about how to improve the institution on a comment wall. We work with people on programs in their neighborhoods, relevant to their stories, so that people get personally connected. And we look for pathways—whether inside or beyond the museum—for people to go deeper. This might mean taking on a project in our historical archives, starting a studio art practice, or getting involved in local issues and organizations. Empowerment is the “individual” side of our theory of change. The other side is about building social capital through bonding and bridging. These terms come from Robert Putnam, Harvard researcher and author of Bowling Alone. Both bonding and bridging contribute to building community. We bond with people who are like us. We bridge with people who are different from us. Putnam and other researchers have collected lots of data demonstrating that in the past 50 years in America, bonding has increased and bridging has decreased. We live in an increasingly polarized world, with fewer and fewer opportunities to connect with people from different backgrounds and perspectives. We are more bonded than ever, and more segregated from each other in our respective bonded spaces as a result. Museums are great places for bonding. Decades of research have shown that one of the primary reasons people go to museums is to bond with friends and family. While we welcome the people who come to our museum to bond, they don't need much help from us to do so. Bridging is another story. If we don't focus on designing for bridging, it won't happen. So we spend most of our energy working on ways to bring people together from different walks of life in the museum. We bridge by bringing together unlikely partners--across artistic & historical practices, socio-economics, race/ethnicity, and age. Our programming isn't for target audiences. We strive to be a place where you will always meet someone new, someone who is not like you, in a positive environment. I'm proud of the bridging work that we do. But it is so, so delicate. Bridging requires careful balancing of who is in the space. If any one bridged group starts to take over, it starts to become a bonded space. As Jane Jacobs noted, "self-destruction of diversity is caused by success, not failure." She was talking about gentrification of neighborhoods, but the idea carries over. When too many of the same kind of person flock to a place or program, it weakens the ability to bridge. We're struggling with this right now when it comes to family audiences. When I first came to the museum, it was not perceived as a family-friendly place. As we developed new 3rd Friday community festivals, we were careful to design them as intergenerational experiences. More and more families showed up. Now, families are dominant at 3rd Friday, and some adults feel like "it's a kid thing." Keeping bridging alive requires constant attention and effort. But it's worth it because of how important it is to building a stronger and more connected community. This vision of a museum working to build a stronger and more connected community is deeply important to us in Santa Cruz. But I don't think that every museum should be doing this work. I don't wish that every museum would be community-oriented. I wish that every museum would be clear about its goals, specific about its strategies and measures, and unapologetic about pursuing them. 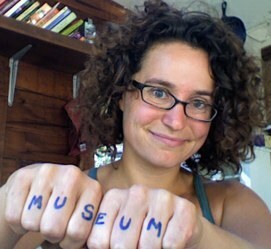 I don't think the challenge of museums is being community-oriented. I think the challenge is being authentic to what your institution is about, the community you work with, the vision you have. There is no one-size-fits-all template for that. Clarity of goals, methods, and measures enables us to proudly and honestly pursue the work that we think is most important. I want all museums to have that. The average scientist, so far as I can make out, spends almost all his time working on problems which he believes will not be important, and he also does not believe that they will lead to important problems. If you want to have impact, if you want to change the world, you have to work on an important problem. So often, we focus on the tasks in front of us. The next exhibition. The marketing campaign. The big event. This work is useful. But if you aren't attacking a big problem through it all, what's the point? There are many important problems that touch the museum field: building stronger communities, transforming the education system, the need for creative play and inspiration, social equity, artists as changemakers, education about global issues. And so on. I don't care what important problem you choose. But I hope you are working on one. Important problems will keep you up late at night, but they'll also get you out of bed in the morning. They are the reason this work matters. They are the only way we will change the world. How Do You Define "Community?" Close your eyes and imagine your organization's "community." Is it a mist of good feeling? A fellowship of uncertainty? Does it have a human face? Communities are made of people, not rhetoric. You can define a community by the shared attributes of the people in it, and/or by the strength of the connections among them. When an organization is identifying communities of interest, the shared attribute is the most useful definition of a community. The second is a quality of the community (strong vs. weak) as defined. I've been exploring three different lens for defining community: geography, identity, and affinity. A community by GEOGRAPHY is defined by place. It is made up of the people attached to a given location: a city, a district, a neighborhood, a country. The simplest version of this community is the place where you live. But you might also feel part of a geographic community related to the place you grew up, or a place you used to live, or a place you often visit. A community by IDENTITY is defined by attributes. It is made up of people who end the sentence "I am _____" in the same way. Jewish. Chicano. Fifth generation. Artist. Some identities are self-ascribed (like "vegetarian") whereas others are assigned externally (like "black"). A community by AFFINITY is defined by what we like. It is made up of people who end the sentence "I like _____" or "I do ______" in the same way. Knitters. Surfers. Punks. People who go to midnight movies. Some affinities are lifelong passions. Others are passing fancies. These types aren't perfectly distinct. A community of people who go to trivia night at a given bar could identify by geography (the bar), identity (nerds), or affinity (trivia). How much does the strength of connections among members matter to the definition of community? It matters in degree but not in kind. A strong community engenders fellowship among members, advances specific social norms, and has identifiable leaders. Weak communities are more diffuse, with members who may not even be aware of each other. These differences are useful when considering how and who to reach out to when trying to get involved with a new community. But the community exists whether it is strong or weak. Maybe you want to work with Hmong immigrants to Minnesota. Or art-lovers of Brooklyn. Or Santa Cruz County teens who want to make social change. Communities may be huge and diffuse, or niche and tightly connected. The key is to be specific in who you seek. My biggest fear about "community engagement" is that it is too vague. It's easy to say "yep, we do that" if you aren't clearly defining the work and the people involved. Defining the community turns an amoebic concept into a human reality. How do you define "community" in your work? p.s. I'll be speaking on these topics at the AAM conference next week. Scroll down in this post to learn more. I wrote this down when Deborah Cullinan said it at a meeting of arts leaders about a year ago. We were discussing the potential for cultural organizations to have significant impact across communities: on planning, health, education, and quality of life. Deborah's vision for the arts leading the way to stronger future inspired me. But I couldn't fully imagine how a museum or an arts center could embody it. Last week, I got to see Deborah's vision in action. The Yerba Buena Center for the Arts (which she directs) teamed up with the San Francisco Planning Department and the Knight Foundation to host the Market Street Prototyping Festival. Over three days, 52 artist teams erected experimental projects along San Francisco's biggest thoroughfare. They turned Market Street into a playground, a performance hall, and a meeting place. The result was a true experiment in designing the future--right here, right now--with artists and planners and civic leaders at the helm together. The Festival is one moment in a decade-long project to redesign Market Street. Market Street is a central artery of San Francisco. It has wide sidewalks and lots of public transportation access points. 200,000+ pedestrians walk along it every day. But it's not just for transportation; it's also a huge swath of public space. In San Francisco, sidewalks account for 80% of all open space. In a city where parks are rare, streets can and should provide the social, recreational, and health functions that we expect from open space. The Market Street Prototyping Festival was not a typical public art exhibition. The projects were messy, unfinished--true prototypes of future possibilities. A fitness trail for urban life. A soundtrack for the street. A urinal that watered plants. Pop up libraries, performance spaces, and seating areas. A hexagonal ping pong table that invited six people (often strangers) to play together. Lots of social bridging, surprise encounters, and more than a few mystified moments. The Market Street Prototyping Festival stirred up a few thoughts related to design in public places, prototyping, and communicating complexity. Just because you put something in front of a lot of people doesn't mean they'll take you up on it. One of the challenges and attractions of the Festival is the fact that most people were not traveling to Market Street specifically to play with the prototypes. They were heading to work, going home, running errands. This made for some amazing emergent engagement behaviors, but also a lot of zooming by. I participated in a mini-observational study of one interactive sculpture in the festival. We found that 12% of passersby even stopped to glance at the piece (let alone interact) over a 15 minute interval. What kind of cultural experience offers the right kind of invitation and opportunity for pedestrians in public space? Many Market Street prototypes struggled because they asked too much of people relative to their expectations and interests as they traveled along the sidewalk. I've often encountered projects that try to address this challenge with confrontation. Put the most disruptive, loud, or provocative experience in the right of way, and people can't help but notice. This may be true, but such experiences are often so dislocating that they put people off and people scramble to get out of the way. Invitation works better than confrontation. 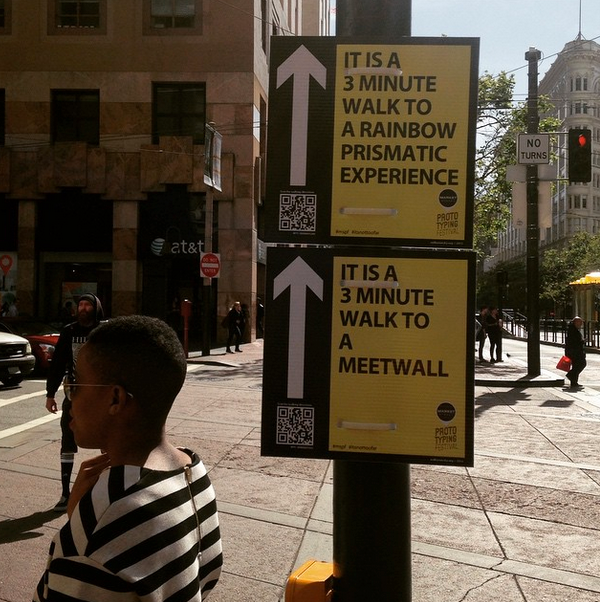 One of my favorite projects, designed by the Exploratorium, nailed the balance of invitation and opportunity on a public street. It was a simple pathway of fringed fabric that invited you to wander into a seating area with information about the drought (it made sense if you were there). The fringed pathways were perfect--intriguing and desirable, easy to walk along, intoxicating enough to entreat you into a new world. Many other projects struggled because the desired engagement was so open to the street. They were open books. The Fringe was a tentacle that lapped you in, a teaser that enticed people into stories they didn't know they wanted. Prototyping is about learning, and learning usually requires communication. I was disappointed and surprised by how few of the Market Street projects were actively manned by their creators. While "final" versions of these prototypes would need to stand alone on the sidewalk, the best prototypes are facilitated. Facilitation has a dual function: the artists learn what worked and didn't, and visitors learn what the projects are all about. Hundreds of hours of community dialogue went into the development of the Market Street Festival prototypes--both on the street and online. Thousands more conversations during the festival. All of this dialogue helps build better projects, and ultimately, a better Market Street. Where it didn't happen, visitors, artists, and organizers missed an opportunity to learn and grow. One of the most frequent questions I heard along Market Street was: "What's going on here?" Many people thought the Festival was "an art exhibit" or "an art festival." ABC news headlined their segment saying "Market Street festooned with public art for 3-day fest." While this is true, it's also a missed opportunity for the larger project. The point of the festival was artists and communities imagining potential futures for Market Street. The artworks were too rough to be "beautiful" and anyone seeking to judge them by that criteria might be disappointed. But as signals about the possibilities of the street? As prototypes for the future? Incredible... and not self-evident. That message could have been more clearly trumpeted throughout the Festival. Overall, I'm amazed at the partnership, coordination, and energy that went into the festival. We often say that "arts deserve a seat at the table" of big civic decisions. It takes leaders like Deborah to claim those seats and launch successful collaborations. The arts ARE future-making. I saw a little slice of the future last week on Market Street. Everyone always says that the best part of conferences happen off the official schedule. Hallway conversations. One-on-one meetings. Late night adventures. This may be true. It's also incredibly frustrating--especially if you are new to a field or if networking sounds like a creepy, painful experience. If the best part of the conference isn't on the agenda, how the heck are you supposed to access it? I'm getting ready for the American Alliance of Museums conference later this month. In addition to reconnecting with old friends and mentors, I want to meet people who aren't on my radar who will help me learn and grow. Join the LinkedIn group (if you are searching, it's called "Hack Your Hello's at AAM"). Post the question or issue that you want to discuss. In the "add more details" section, list your contact info and availability during the conference. That's it. Easy. It worked decently well last year, and I hope it might be even better in 2015. Download the mobile app. It's a bit clunky, but very useful for coordinating your schedule, especially while you are onsite. It's most valuable when you are in a lousy session and want to see what else is going on. Scroll, stand up, and get to something better. Use your feet. There's a ton going on at all hours. Don't be afraid to leave a bad session for something else. Follow people, not topics. So many session titles sound alike. How can you tell if you want to go to "Museums and Communities" or "Museums and Social Issues" or "Museums and Very Cute Lizards"? My solution is that when I find a person who fascinates me, I find out what else they are talking about and follow them. In this way, I've found my idols / mentors /friends--and learned a lot from their inspiring sessions. Go to at least one session on something you know nothing about. Good for learning new things, discovering new mentors, and reconnecting with why you never want to work in that part of the building. Hack your nametag. If you have to wear a nerdy nametag, make it work for you. Add a question, a twitter handle, or a quote that's important to you. People will ask you about it, engage with you around it. Instant wearable social object. Get in touch with people before the conference and set up a meeting, meal, or walk. Hence the LinkedIn group. One of the reasons I like AAM is that it's a behemoth of a conference--so many people are there. Get in touch. Meet them. Learn. Repeat. Monday April 27 at 2:30pm in a solo talk on "Building Stronger Communities" at the Santa Cruz Museum of Art & History. This is the first time I've had 30 minutes on my own at AAM, and I intend to use it to talk about a few non-obvious lessons from the community-based work we are doing in Santa Cruz. Tuesday April 28 at 1:45pm in the "Museum Incubators" session, talking about how our teen program empowers youth to lead social change in our community and push our museum forward politically. This session is hosted by engagement rockstar Kathleen McLean. Kathy's sessions are always honest, fascinating, and fun. Wednesday April 29 at 10:45am in the "Potluck Programming" session, talking about engagement offsite with brilliant colleagues from the Queens Museum, FIGMENT, SFMOMA, and Nelson-Atkins. Enjoy the conference - or at least the LinkedIn group. I hope it helps igniting fruitful conversations. Last week, Ian David Moss and I both blogged about the process of developing a theory of change for the Santa Cruz Museum of Art & History. Here's my post, and his. This week, I'm focusing on the WHAT of the project instead of the HOW, with a slideshow we made to describe the theory. What is your organization all about? What are you trying to accomplish? How do you connect the work you do to the goals you seek? At the Santa Cruz Museum of Art & History, one way we're answering these questions is with a theory of change. It's a logical flowchart that connects activities to outcomes to impact. There's a lot packed into this simple image, so we made a five-minute tour of our theory of change, featuring voices of staff members at our museum. If you can't see the slideshow in the post, click here to access it online. It has audio, so make sure you have speakers or headphones. I'm curious how this slideshow comes off and whether it makes it easier or harder to understand. I'd love your feedback on it. We had fun making it, but I'm not sure whether it's the clearest way to engage with the theory of change. This theory packages together so many of the things we're passionate about in our work at the MAH, and I'm trying to find the best way to convey these concepts. Please share your questions and comments--about the format, the content, or whatever strikes you. I'd love to engage in a discussion with you about it based on your reactions.